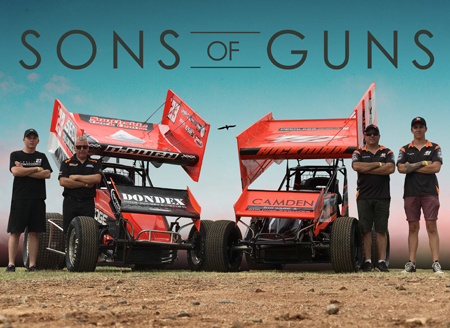 After seven rounds of the 2018-19 instalment of World Series Sprintcars, fans and officials alike have on occasion confused the liveries of contracted young guns, Rusty Hickman and Lockie McHugh, but as series host Bennie Bish discovered, the similarities between the two hotshoes do not stop there! Just 18 months separates the age of the two young guns, with Rusty the junior of the two, turning 19 on the 28th of November just gone, and Lockie currently 20 years old until May 21. The surnames Hickman and McHugh and are well renowned in Australian Speedway circles, with dads Jamie and Darren formerly fierce competitors in Super Sedans with Bendigo based Darren a multiple South Australian champion and two-time K-Rock Cup winner, while former Tasmanian, now Gold Coast homed Jamie achieved two national titles in Super Sedans and also bagged a pair Australian crowns in Modlites. Darren eventually became a regular on the Victorian Sprintcar scene, particularly in the 360’s claiming the 2007 Allstars Series, but has fond memories of the two families spending a lot of time racing together in the tin-top years. And while the dads have both moved on to crew-chief duties in their teams, both mums have also adopted similar roles of team management for their respective camps, looking after team logistics “and keeping the boys in line,” despite having racing backgrounds of their own. Sandy Hickman was a standout in AMCA’s, Wingless, and 360 Sprintcars before giving the racing away to focus on Rusty, while Sharon McHugh didn’t pursue quite as serious a career, laying claim to winning some bomber races in the early days. Her highlight (as she calls it) was barrel rolling an XU-1 Torana in a “Powder-Puff” race at Surfers Paradise Raceway and consequently broke her sister’s arm in three places as she was riding as passenger. “Most people believe that Lockie gets all his talent from Jamie, but the reality is he gets it from me as well,” Sharon says, with her tongue firmly planted in her cheek. Despite the joking, Lockie’s racing talent definitely comes from both sides with Sharon’s brother Troy Dunstan the 1992 Formula Ford “Driver to Europe” Champion who also claimed the 1992 Bathurst Rookie of the Year honours finishing 7th as co-driver for Andrew Miedecke and then followed up in 1993 to finish 5th alongside Steve Harrington in the Pepsi Quix Racing #55 Commodore. With both cars sporting hi-vis fluorescent orange liveries, McHugh’s Sedl Contracting #Q23 and Hickman’s Peerless #V40 could be mistaken to be from the same stable. McHugh is at home in his Cool Chassis that was literally finished on the afternoon of the fifth round of World Series on January 1 at Warrnambool. Hickman is committed to his J&J however has also just finished bolting a new car together for the final three rounds of the series after taking a couple of sizable hits at the Classic. Brisbane’s Australian Sprintcar Open preliminary A-Main has been the stage for both driver’s career breakthrough wins. Despite winning other minor events, Lockie made his big-race wingdance debut at the 2017 Open at Brisbane to make a resounding announcement of his arrival on the Australian Sprintcar scene at just 19 years old, and Rusty repeated the feat just weeks ago, also as a 19-year-old. “Opportunistic” is the word both gassers have settled on to describe their driving style, with “aggressive” not so favoured as it comes with a somewhat risky connotation. “How do you define aggressive?” Rusty asks, objecting that “aggressive” is often the term that’s used to kindly describe a racer who pushes too hard and ends up hanging out of the fence or taking someone out. Both drivers are well aware that the chances of making a living from racing are limited, and have wisely committed to studying while their driving careers develop. Lockie is currently in his second year of studying Acturarial Science which is essentially an economics degree at Bond University, while Rusty is now a qualified engine builder and is currently completing his apprenticeship as an Arborist, following in the footsteps of his father. Away from the racetrack, Lockie and Rusty mutually share an impressive work ethic that makes them standout in a generation that seems to be attracting a lot of criticism for lacking initiative. After three years burning the candle at both ends, Lockie has just finished working on secret Formula One cooling system components at PWR and is considering developing a vehicle trading business while he studies. Rusty meanwhile has created a side-business trading cattle, and currently runs 40 head on the family acreage.